Across the globe, vital aquatic ecosystems are impacted by dangerous contaminants not adequately treated by conventional wastewater treatment systems. BlueTeak’s Chemically Enhanced Treatment completely destroys these contaminants and pathogens without creating another waste stream that requires further treatment. BlueTeak research and development is based on a system that will provide clean water through a proprietary chemical based cleaning process. Our system is able to supplement and/or replace more commonly used biotechnology wastewater treatment and water purification systems in the market today. Our technology is capable of discharging sterile, nutrient, heavy metal, pathogen and odor free water. 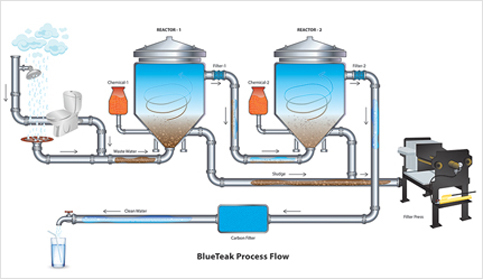 BlueTeak wastewater treatment technology is a high volume, physical/chemical treatment that can be offered in a totally enclosed portable system or an in ground unit that exceeds EPA clean water discharge standards by producing sterile water and sterile sludge. BlueTeak Water thrives to be global leader in efficient waste water treatment solutions. To be a valued partner for our customers in developing customized water treatment solutions. To strengthen our technology leadership through continuous research and development. BlueTeak specializes in providing comprehensive and cost effective solutions to wastewater problems by developing treatment systems that can effectively treat recalcitrant wastewater types. Our principal scientist has over 30 years of experience in water treatment, environmental science and regulatory compliance consulting. Our innovative and patent pending technology can treat a wide variety of waste streams: primary metals and metal finishing, food and dairy processing, domestic sewage and sanitation, refinery and petrochemical, oil field exploration and others. The heart of our technology is our proprietary process and treatments to remove 99% of TDS, TSS, Organic matters without reverse osmosis, electro-dialysis, ultra-filtration, ultra-violet light, ionization and other industry leading costly technologies and solutions. Regardless of what contaminants are embodied in water, we separate clean water from present contaminants through a simple patent pending process. The world today consumes increasing amounts of water; thereby producing more waste streams than nature can handle. Although policy makers, industries and citizens around the globe are making great efforts to minimize waste, waste streams in many countries continue to grow. Our solutions and technologies allow communities to enhance their sustainability levels by turning their waste water into potable water. Our wastewater treatment technology turns dirty effluent into clean water that can be reused or returned to nature.